The Piccadilly Rats are a busking band who regularly perform in and around Manchester city centre. Notorious for their rough-and-ready cover versions of old pop and rock standards and their rat masks, this collection of musical eccentrics have charmed and amused visitors and Mancunians alike. The Piccadilly Rats were formed in 2013 as a trio and has subsequently grown in to the six piece band we know today. Founding member and band leader Gaz Stanley, is the principal musical influence within the group and originally came up with the idea of the rat masks. This made the band standout from other street acts in the city centre, but Gaz soon ditched his own rat mask as he realised that his vocals couldn’t be cleared heard when performing. 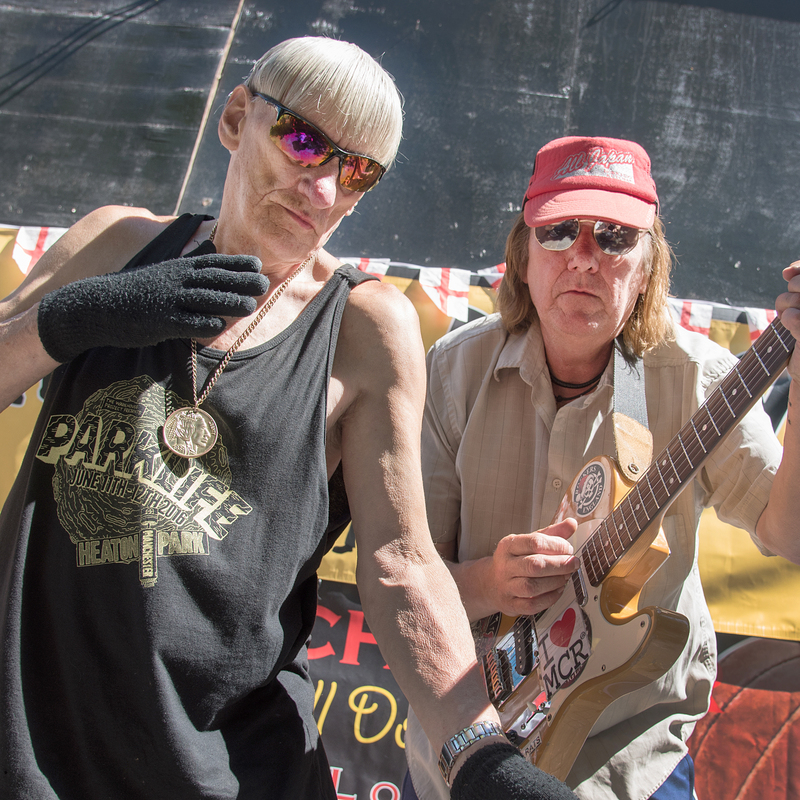 The Piccadilly Rats resident ‘freaky dancer’, Ray Boddington joined the band in 2013 and has become one of the groups most intriguing characters. Ray’s hypnotic dance moves bring a profound sense of ‘Madchester’ to the band’s performances. Other notable band members include drummer Alan Jones and Tommy Piggott – known as ‘Tommy Trouble’ – whose trademark is dressing in a 1960s Policeman’s outfit, wooing the ladies or stroking a large furry rat. The Piccadilly Rats became known to an audience of millions when they appeared on ITV’s Judge Rinder and were also the subject of a 2015 documentary. In recent years, Ray Boddington has appeared on TV’s X Factor and Britain’s Got Talent. The Piccadilly Rats memorably opened the main stage at the 2018 Parklife Festival after being added to the line-up as a result of a direct appeal to the organisers on Twitter.